One of the chores that we hate doing the most in our house is the ironing. There are several reasons for this. Firstly, we have A LOT of clothes that we stupidly allow to build up and build up so that we’re then faced with a humongous ironing pile. Secondly, I have a lot of hard to iron clothes as my dad would put it. What he means is, I wear dresses and tops that are complicated shapes, made of fine fabrics and full of layers, frills and heaven knows what else. Lets, face it, they look beautiful on so I’m not about to stop wearing or buying them anytime soon. And lastly, my dad and hubby end up doing the vast majority of the ironing because the iron we have is too heavy for me to be able to lift. That might sound ridiculous to some but to cut a long story short, a couple of years ago, I had an accident which damaged my neck and now I struggle to do things that I could do before, like ironing. I can manage the odd piece but not much more than that which is really frustrating. Over the years, we’ve come to realise that steam generator irons are the best way to go and you definitely get what you pay for. 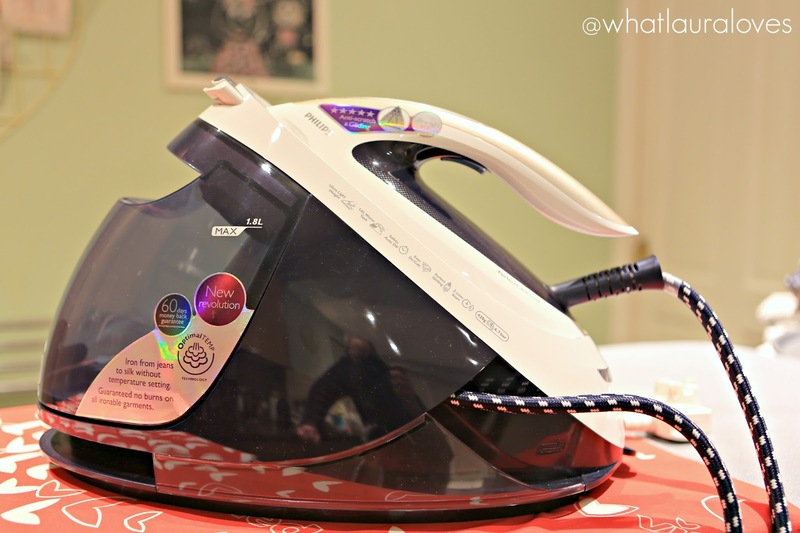 We’ve been using steam generator irons that come with a water tank for easily the last twelve to fifteen years and over normal irons, they do make such a difference. However some are better than others as we’ve come to find out over years of buying them. When looking for an iron, we always want something that is going to be high performing, gentle on our garment fabrics and easy to use but until you get it home and start using it, you don’t really know how well it is going to work for you. This is what happened when we bought our last iron as while it irons jersey and cotton fabrics well, it isn’t great at steaming chiffon style fabrics which a lot of my dresses are made from. Plus it is really heavy which means that I can’t really use it comfortably now. 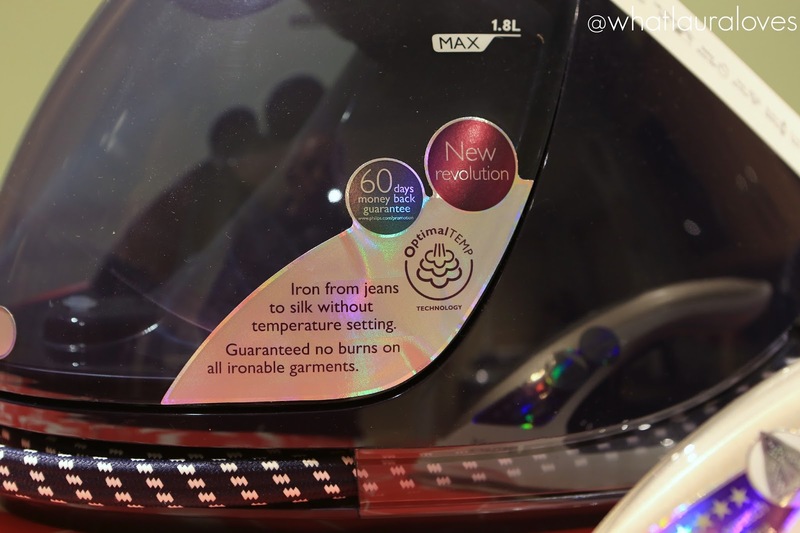 So we knew that for our next iron, not only did it need to be efficient, high performing and gentle on our clothes but it also had to be light weight too. 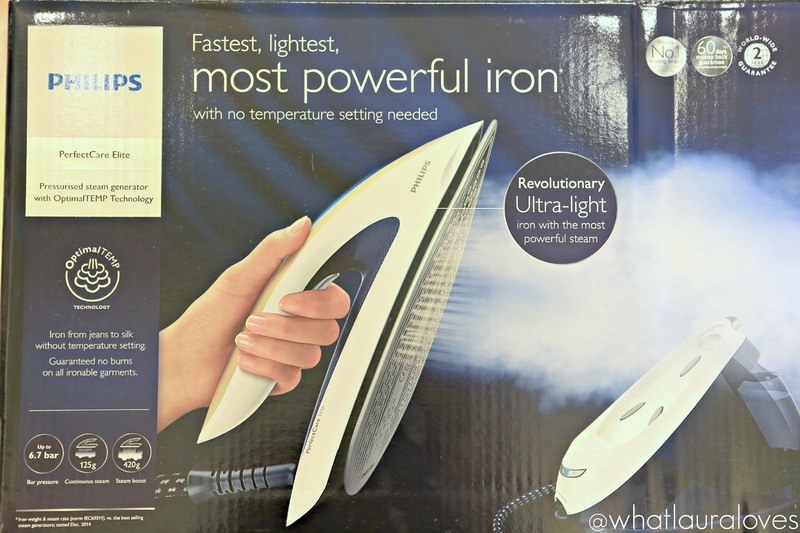 When Philips asked me to test out their PerfectCare Elite Iron, I was more than happy to as soon as I read that it is their lightest iron, before I even found out about all of the other great features it has. You see, while it may sound great to be able to get out of doing the ironing, it does get pretty annoying when you want to wear a particular outfit and can’t because it is completely creased. The ironing was always my job in the house, amongst others, before my accident so I feel really guilty that I can’t do as much around the house as I used to. 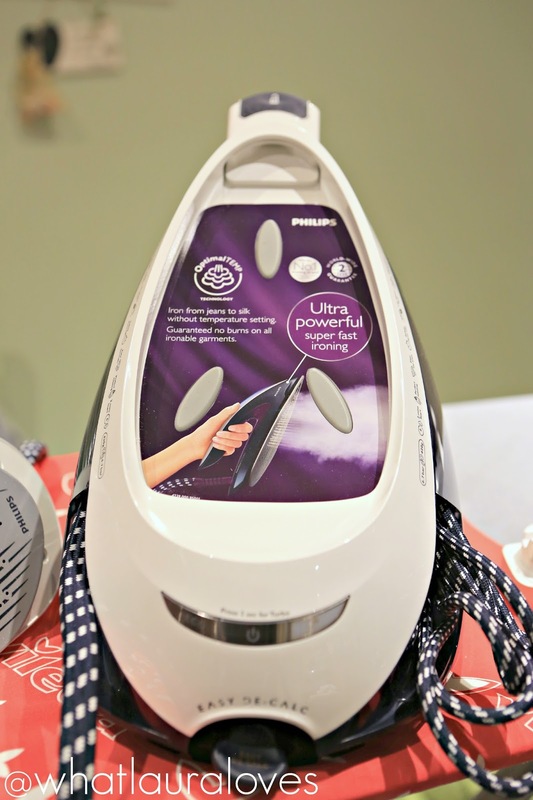 The Philips PerfectCare Elite Iron is their best and most efficient steam generator iron yet and over the last month, we’ve all be putting it to the test here at WhatLauraLoves HQ and I’ve gathered our thoughts together for this blog post to give you a thorough review. Aesthetically, this iron really looks the business with its crisp white iron, silver accents and dark blue tank. Not that its appearance makes any difference to the performance of the iron but it does make it pretty to look at. Size wise, the base is fairly large but the chord to connect it to the iron is very long so you can easily leave the base on a kitchen work top and the iron will easily stretch to the ironing board. The great thing about the the design of this iron is that you don’t need to keep putting it back onto the base station while you’re ironing. You can simply leave the hot soleplate of the iron on the ironing board without burning the cover, thanks to the safe rest feature, which is great if you’ve left the base on the bench and you’re just stretching over to the board. I especially like this because it means that I’m not having to lift the base of the iron at all which could be quite heavy for me, although the iron itself is incredibly light weight. However, should you need to move the iron and base for any reason, this iron does have a very good safety feature that clicks into place to attach and hold the iron securely to the base to stop it from falling or sliding off which I think is an excellent idea. Surely every iron should have this feature? To set the iron up, all you need to do is to fill up the detachable tank with normal tap water. It takes a whopping 1.8litres so the perfect size if you have a large family with lots of ironing to do and again, there’s no need to move the base as the tank comes out so theres no heavy lifting or potential of dropping it. Even if the water tank runs out of water while you’re ironing, as indicated by the red warning light on the base, you can easily refill it without having to wait a while or turn off the iron first which my husband in particular, really liked the idea of. When he’s ironing, he likes to power through and get it all done in one go as he finds that if he has to stop mid way, he gets bored and finds it a chore to have to come back to the ironing! After you’ve filled the tank up, you simply plug it in and switch it on. Theres a blue light on the iron that will flash to show that it is heating up and after two minutes, it stops flashing to indicate that the iron is good to go. It really is that easy. Aside from off and on, there are only two modes to choose from which are indicated by buttons on the back of the base of the iron; ECO and Turbo Steam Mode. ECO is the one that you would select if you wanted to save energy as when using this mode, the iron produces less steam which enables you to save energy but still get a great result with your ironing. In comparison, Turbo Steam Mode generates far more steam which enables you to power through your ironing at an even faster pace. We have tried out the ECO and Turbo Steam Modes on a range of garments and have found them to work equally as well although we do prefer the speed of the latter mode, especially when we have a lot of items to get through, or if the item we’re ironing has a particularly thick fabric or feature, such as a statement pocket made of a different fabric to the rest of the top. What was very apparent for all of us from using this iron is that it does actually work far more effectively and efficiently than any other we have had in the past. It powers through creases incredibly well and leaves the garment looking pristine in no time. That is undoubtedly due to having up to a 6.7 bar pressure which is the measure of the amount of steam generated by the iron. 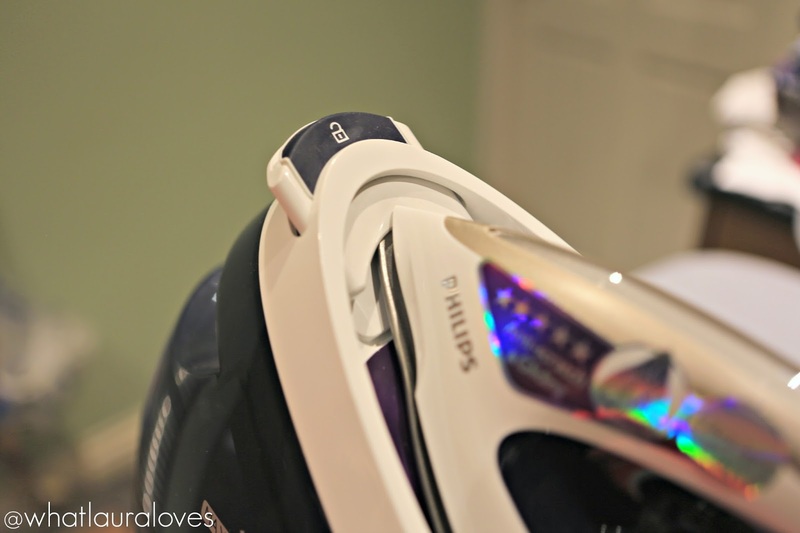 Steam generator irons have a far higher level of steam generation that regular irons where you fill the actual iron up with water anyway because the separate base enables them to generate more steam but the Philips PerfectCare Elite Iron generates a significantly high amount which basically means that you can iron much faster than you would with another iron. The stream of steam is consistent and powerful which enables it to penetrate deep inside garments to iron them more efficiently and effectively. Saving time is really important to us all as we’re very busy people who are always rushing around so we don’t have a lot of time spare for household chores. To find that this iron could help us to complete our ironing pile in half the time than it would usually take was revolutionary for us. I do think that the bar pressure definitely has a lot to do with it because it generates so much steam that gets creases out of my clothes like never before. However I also think that the Philips OptimalTEMP technology plays a massive part in it too. OptimalTEMP technology is an innovative invention that is essentially the perfect combination of steam and temperature which enables you to iron all fabrics with one perfect setting. This saves so much time as with other irons we’ve have in the past, we’ve had to stop ironing, adjust the setting to suit the garment and then wait for the iron to become ready for use again. With OptimalTEMP, I’m able to iron anything that I want in any order, all on the same setting. 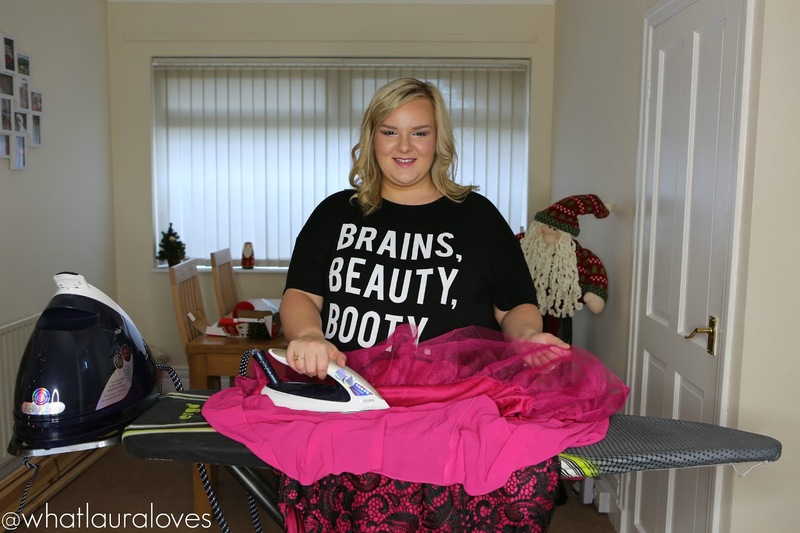 I discovered this when ironing my plus size Christmas party dress which you can see in my outfit post here. I knew from the word go that this would be a pain and a half to iron; it was even creased in the shop so by the time it had sat in the carrier bag for a few days, the creases were even worse. The dress has a floral lace overlay on the top, then a floaty, chiffon style fabric and a delicate lined underskirt with a structured mesh trim. It was advised on the label to iron this piece on a low heat but I was able to iron it perfect on the same setting as everything else that I had been ironing that day from a cashmere jumper to a cotton vest top. I ironed the underskirt on the board and then hooked the dress over the door to use the iron to steam it upright. Obviously I’m just giving you an idea in these photos as my set up wasn’t ideal with me trying to catch some natural daylight but I’m sure you get the gist. What I immediately noticed about this iron is how incredibly light weight it is to hold, certainly lighter than any other iron I’ve used. It really does glide over fabric with next to no effort as with my injury, I certainly can’t put my back into such tasks like this. If you have any issues with your wrist, I don’t think you’d have a problem with this iron as it is very easy to maneuver and the effect is always smooth regardless of the fabric you’re ironing. With the Philips PerfectCare Elite Steam Generator Iron, you’re able to literally iron any iron friendly fabric from denim jeans to silk and chiffon without having to set a specific temperature on the iron as they are guaranteed to not burn, especially with the safe rest technology on the soleplate. This is great for me as I would always get really confused as to which temperature setting to have the iron on and if incorrect, it could lead to burning my clothes. The soleplate itself is Philips’ best gliding soleplate and its easy to see why as it powers over garments easily and the pointed tip enables you to easily get right into corners which I have found to be particularly handy for shirts. The soleplate is actually 5 star rated and is integrated with a Titanium-Oxide layer to give it a smooth gliding performance for quicker and easier ironing and to make it scratch resistant. This iron has an Advanced Smart Control Processor which precisely controls the temperature of the soleplate and an ultra powerful multi-chamber, cyclonic steam engine that delivers a consistent, more powerful steam. While I haven’t needed to do this yet, I am confident that this particular iron would be easy to descale as it. Being able to descale an iron effectively is really important to prolong its lifespan which you should definitely want to do, especially if you’ve spent a lot of money on it. 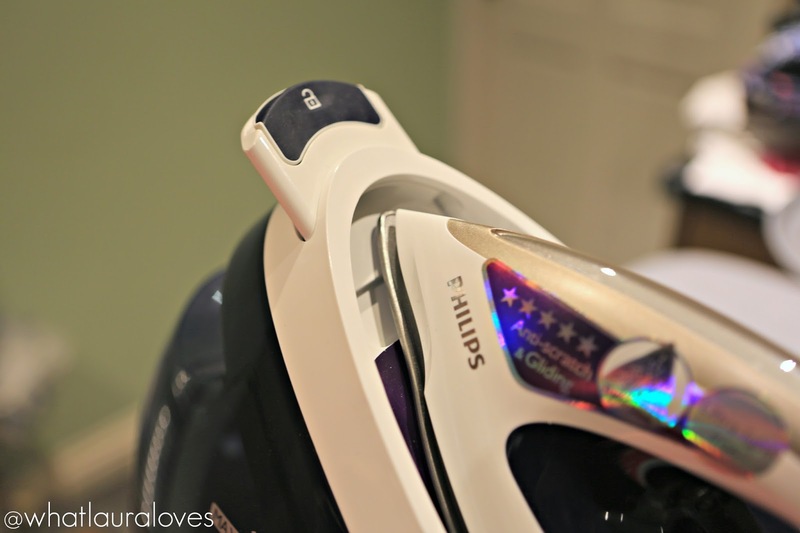 On the base of the steam generator iron, Philips have positioned their Easy De-Calc Plus function. This will let you know if your iron needs descaling with a light and a sound. All you need to do is to wait until the water is cold and then turn the Easy De-Calc knob with a cup or a jug under it and the dirty water and scale will run out of the base. Sounds pretty simple doesn’t it? The final feature that really sold this iron to me is the safety auto-off feature. This is where the appliance will automatically switch off it it has not been used for 10 minutes. The general aim of this is to save energy but let me ask you this; how many times have you left a room or even got in the car and driven away from the house only to have to return to check you’ve turned the iron off? 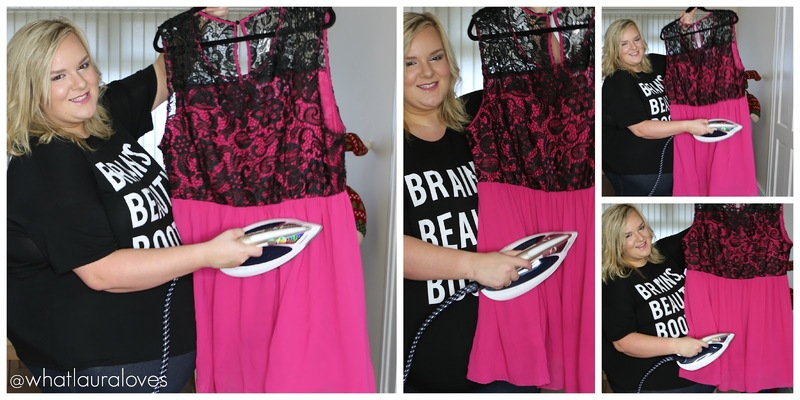 I do this ALL the time so having a feature like this where I know my iron will switch itself off is not only good for saving energy but its also even better for saving my peace of mind! While I don’t think I’ll ever sit here and say that I love ironing, having a one that works as efficiently as this one certainly means that I don’t dread having to pick up the iron because I know that I can get the job done quickly and pristinely the first time round. If you’re someone who does a lot of ironing and likes to get it done quickly then this is definitely worth the investment. Or, if you’re someone who struggles to lift other irons because they’re too heavy an awkward to hold, then this iron will be perfect for you also as it is so lightweight and easy to maneuver so it doesn’t place as much strain on your wrist, arm or up into your neck. 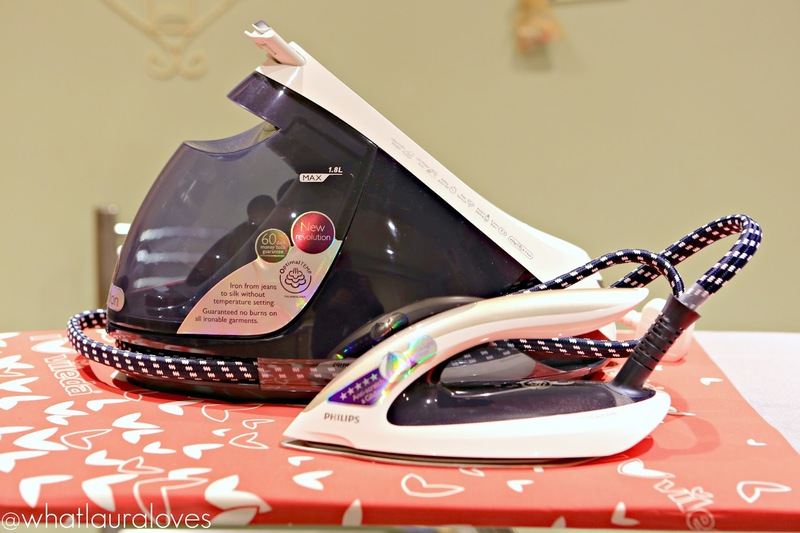 You can shop the Philips PerfectCare Elite Iron here. Previous Post Scarlett & Jo Brand Ambassador Announcement! You even look good ironing. I have a Phillips iron and it is a fantastic brand. You know what, I was only thinking yesterday that I need a new iron as the one I have is useless. The one we had wasn't cheap either, but it just doesn't do what it is supposed to. It looks a dream, there are only two of us and the ironing basket is always overflowing! I quite want one…. I personally haven't ironed in years. I buy clothing that doesn't need it and I also dry clothes in a way where they won't crease. I know when the kids go to secondary school, the iron will have to come back out. But I agree… Steam is the only way to iron!! This looks like one powerful iron. I am looking for new one so will check this out. I love the idea of a safe rest feature. Although it's not a difficult task putting the iron back it is annoying when you need to rest it for a second! I hate ironing too but with a good iron, it is enjoyable.